A few personal reflections before hosting a panel on methodologies of production at i-Docs 2018 (21-23 of March, Bristol). 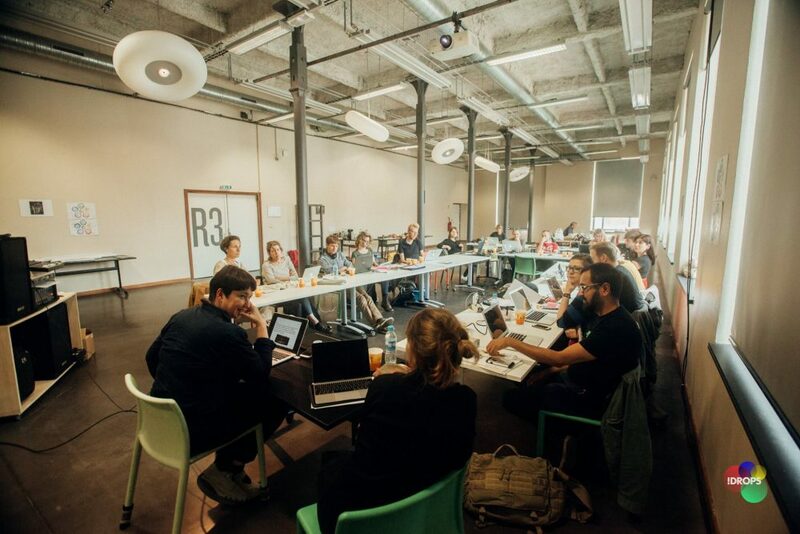 Our application to the IF Lab 2018 workshop, a training in interactive storytelling, is opened till mid February. But why should you apply? What is !F Lab, and what are we trying to do? 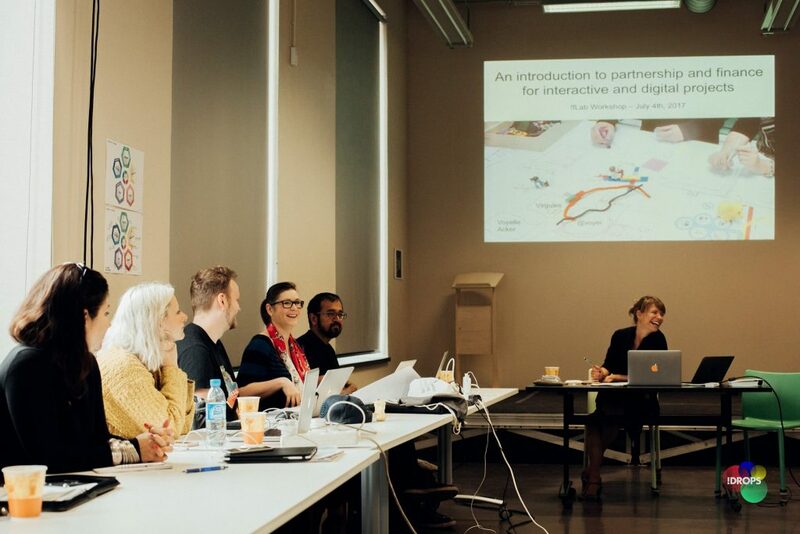 While I am waiting for challenging and inquisitive projects to apply to our 4th workshop I am reflecting on how the workshop has changed and iterated itself since 2014, both in terms of its aims and methodology. !F Lab stands for Interactive Factual Lab, it is a EU funded workshop that I proposed to Creative Europe (as a collaboration with Belgian digital innovation company iDrops) because I could see there was a gap in the interactive non-fiction market: a few digital agencies seemed to be behind the most acclaimed web-docs and transmedia projects, while documentary production companies and independent creators seemed to stay behind, often lacking confidence on how to best translate their ideas into an interactive product. The original idea of !F Lab was to provide a mini-incubator where ideas could be tested, mentored and developed. 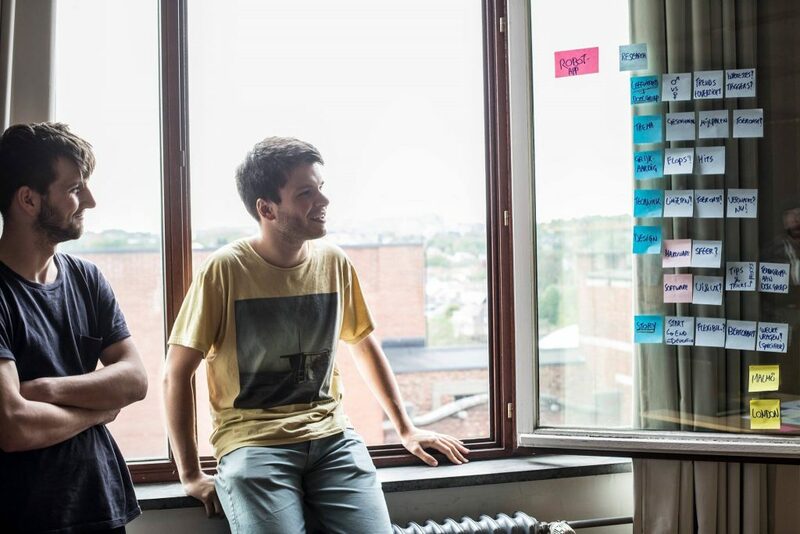 The fundamental point was to introduce design thinking into the production process and to encourage people to work with designers and coders from day one. Four years down the line, !F Lab has developed its own methodology and I am personally moving into a space where I want to test it and collaboratively question its results. what mixture of design, software and storytelling methodology is most suitable to the creation of interactive non-fiction? what are the pros and cons of following a methodology? The WHAT IF IT Process is the result of the expertise and contributions of the several tutors we had mentoring at !F Lab, and of my own magic sauce. Our core mentorship team has always been composed of Mike Robbins (Helios Design Labs & High Road Productions) and myself, but through the years we had the invaluable help of several design and UX specialists, creative technologists, interactive producers, pitch and finance specialists (see !F LAb’s website for the full list). Our workshop structure has changed throughout the years: we use to have 3 sessions of 4 days, we now have 2 sessions of 5 days. 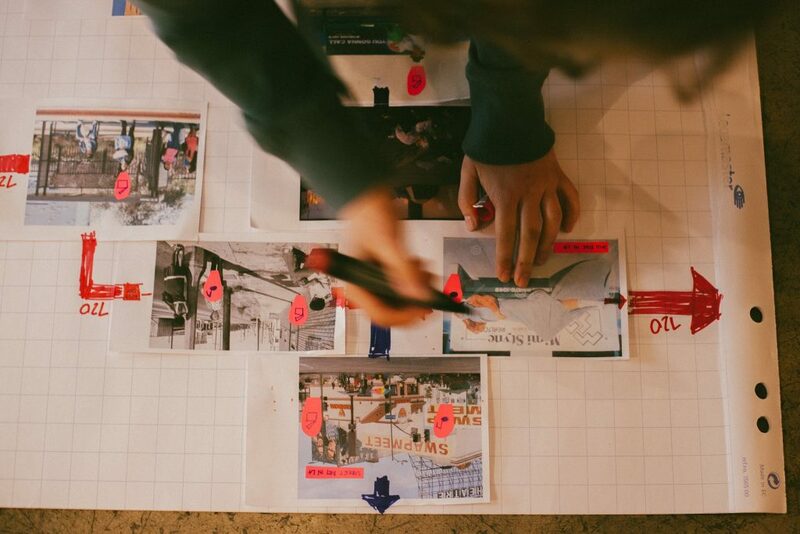 However, the first session, the so-called Story Booster has always been dedicated to the deconstruction, and final reconstruction, of the core idea of each participant in order to build on a stronger idea once moving into paper and digital prototyping of the concept. 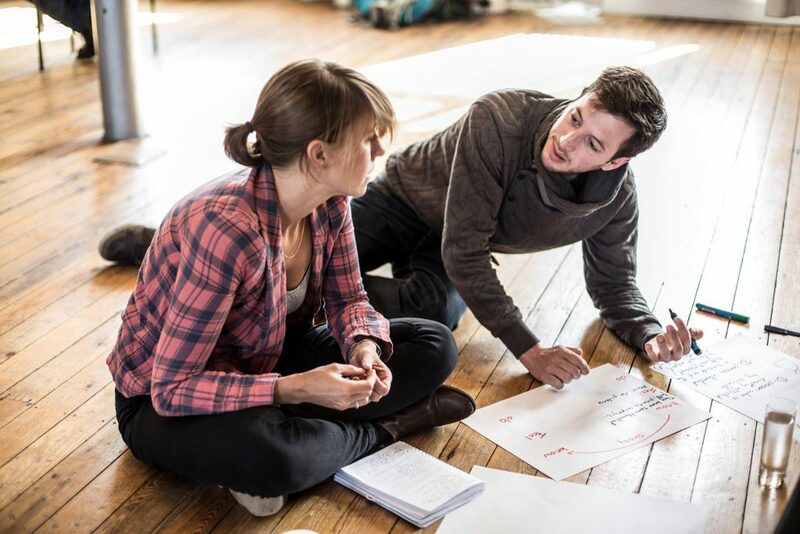 – We ask participants to introduce their ideas on day one of Story Booster and use the whole group to highlight inconsistencies and identify potential issues. – We then spend day two and three challenging their ideas by filtering through a design process where we question the target audience, their possible motivations, the added value of the project, its wished impact and out of that we work out possible platforms and ideas. 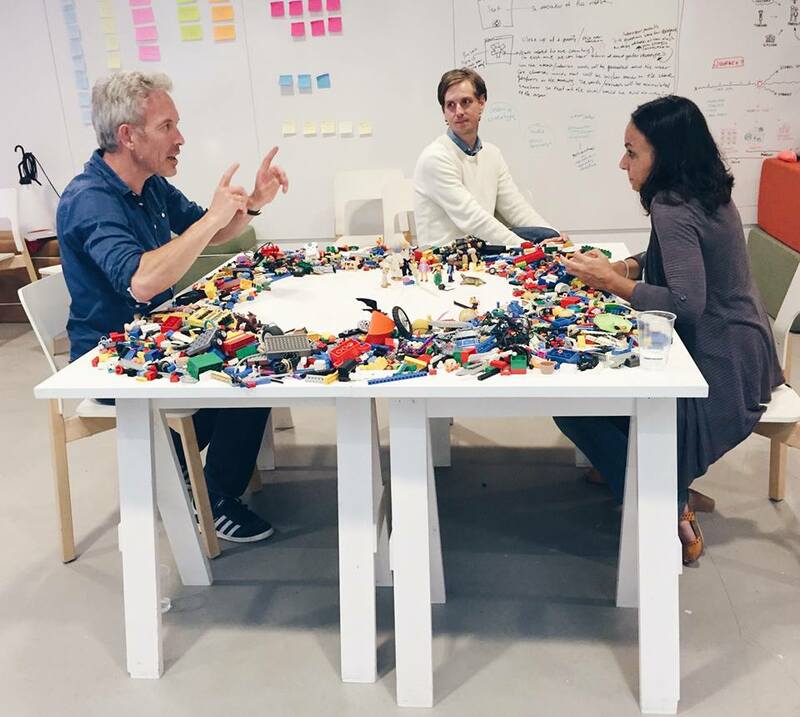 – We finally spend a whole day prototyping possible ideas on paper, and use our final day testing the prototypes, and coming up with a solid concept that gets presented to the whole cohort to close the circle of the workshop. In order to go through these steps we used to have mini-lectures, and then break into hands-on exercises. 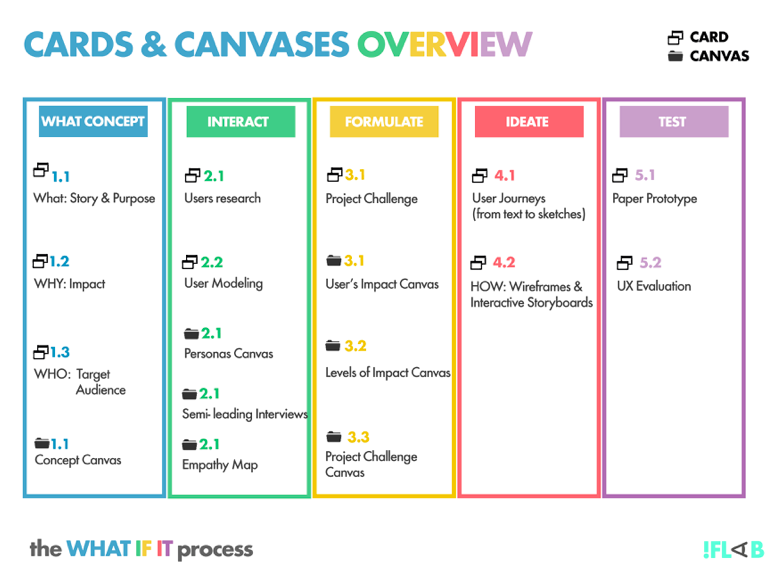 This dance between learn & do inspired the creation of the !F Lab “Cards” (mini-lectures with examples) and “Canvases” (one page exercises that each project does to help them take decisions). 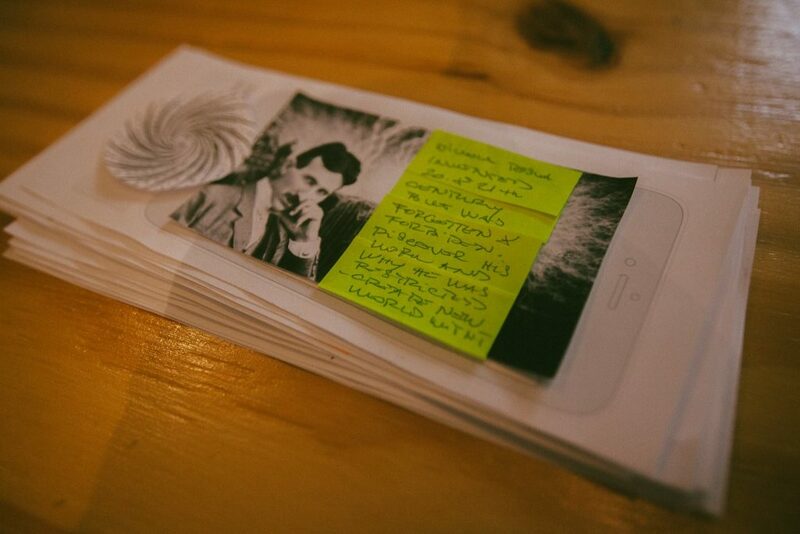 So if you come to !F Lab this year, you will benefit of the accumulation of knowledge of three years of trial and error and you will use what effectively has developed into a methodology of interactive development: the WHAT IF IT Process. Having a process seemed to be the easiest way to move quickly through creative decisions, but also to have a base to come back to after the workshop. Many participants told us things were going very fast for them during the workshop and they needed some time to step back and assimilate what they had done with us. 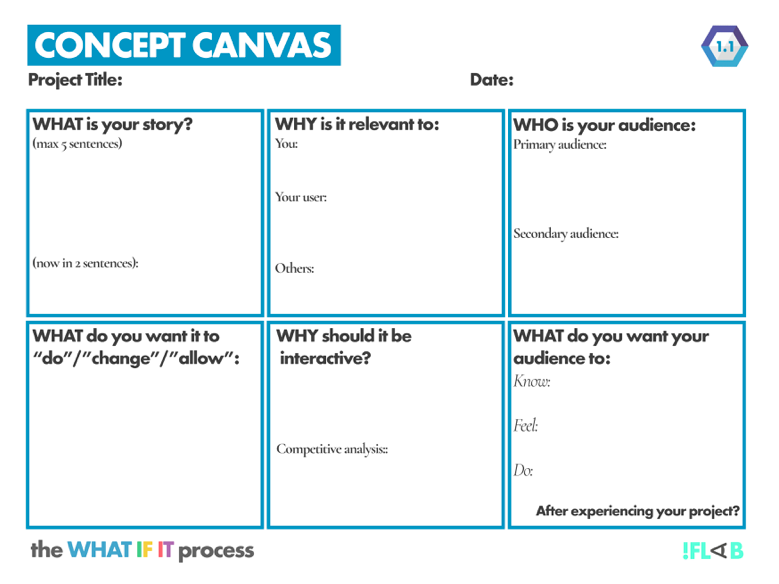 The WHAT IF IT Process attempts to mix three distinct methodologies (software & agile, UCD & design thinking and storytelling) in order to help creators to choose the best platform and interactive communication strategy to reach their goal and tell their story. The challenge in introducing User Centre Design in a storytelling process is to trust that if you start from your users’ needs (rather that from your assumptions of their needs or, more frequenly, from your wish to tell your story) the interactive concept will develop by itself – or rather, the elements that will inspire you to create your interactive structure will emerge from the process itself. This approach to creative thinking is totally alien to anybody that has trained as a journalist or documentary maker so… it needs time to sink in. What is done as an act of faith during the workshop, needs to be accessible and re-usable after !F Lab. From all the internal interviews we have done last year (I am working on a paper on this, and also on a presentation for the forthcoming i-Docs Symposium where I will be joined by quite a few IF Labbers!) everybody felt “reassured” by having “a structure to come back to”. But what we are working on at the moment is fine-tuning the right mix of methodologies probably to re-inject some lessons learned from storytelling – such as emotional mapping and engagement through carefully designed story beats, inspired by Robert MacKee’s use of beats in a scene (1998). I also think that if we want to rebalance the fine line between innovation, user experience and suspension of disbelief, we might need to think beyond currently accepted UCD processes and introduce other branches of design – such as Experience Design and Critical Design – in order to create ‘transformative experiences’ for the users (Mullaney, 2015:152). So, this is what we are working on, and iterating as we go. 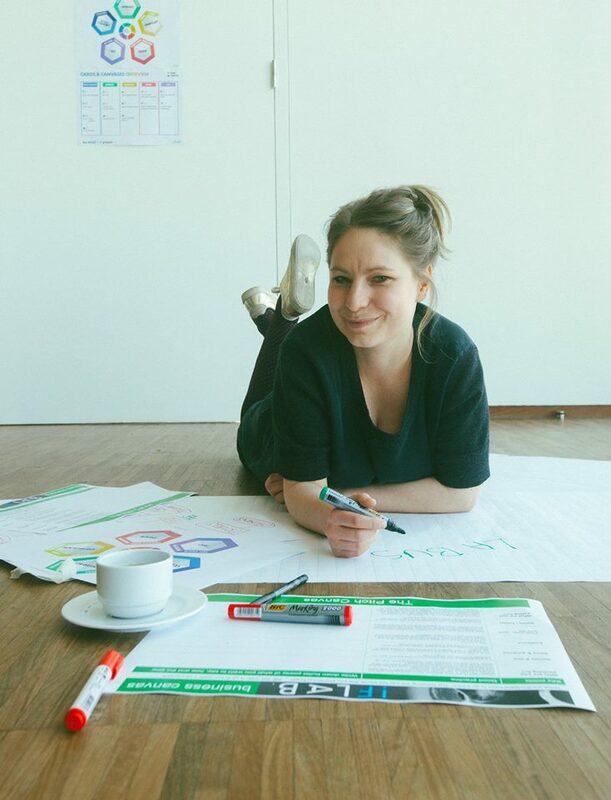 The second week of !F Lab takes place two months after Story Booster – to give a chance to participants to consolidate their project ideas, and to test their concept with their future audiences. 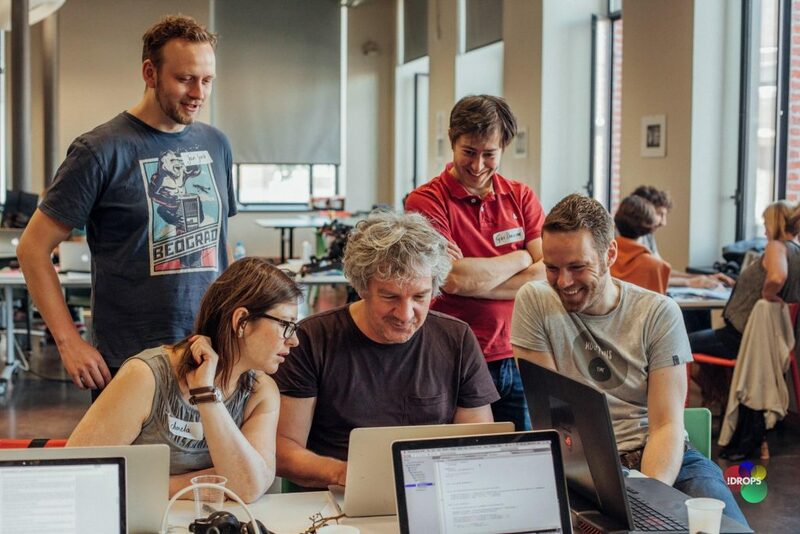 Once we reassemble for Prototype Booster, we really step in the world of digital design and coding by organising our version of a Hackathon (we call it a Prototype Jam) – two days and a half of working with technically skilled people to transform rudimentary ideas into working digital prototypes. The week finishes with a pitch (or more modestly a show of work in progress) to a jury of professionals. Last year we were in France, so we invited Elie Levasseur (from the Cross Video Days Market), Voyelle Acker (ex France Television digital commissioner) and Blandine Lebourg (from La Plaine Image Digital Hub). From our past experiences we have noticed that this is a painful moment as stress is high and not everybody is good at explaining the connection between their “big idea” and what they have prototyped. On the other hand, we believe this is an invaluable experience and we want people to use it as “safe” dry run for what is coming next. After !F Lab projects tend to look for production funding so they need to get good at writing their treatment and pitching their ideas to funders, partners and potential future team members… so clarity is compulsory, and this, as we all know, takes time… better to start early! This year’s iteration will make us experiment withhaving the pitch on the morning of the last day to allow for a full afternoon of individual feed-back on the projects. Hopefully this will allow participants to make the most of their time with our decision makers, but also it should give them the time to reflect on what they achieved and what they need to do next. One of our core aims is also to help authors think as creative entrepreneurs, and not only as “content” people. This is a steep learning, but it is the only way to survive in the current market so… welcome to reality! 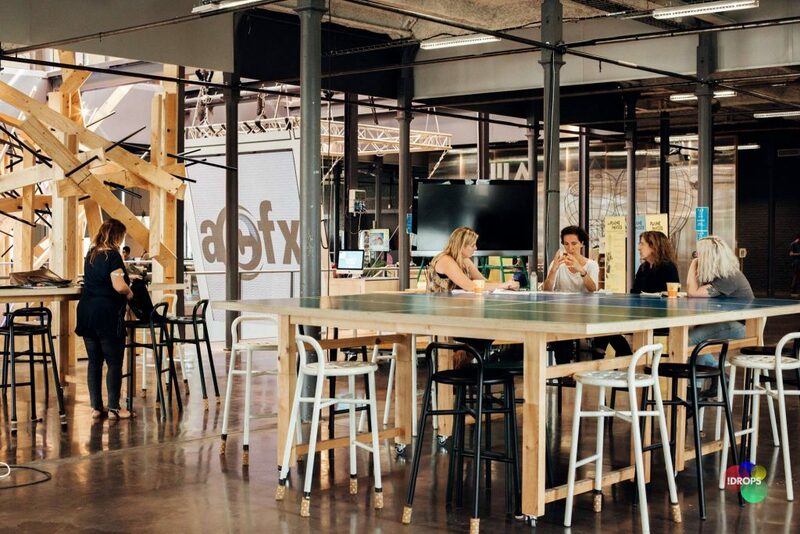 The advantage of doing it at !F Lab, is that we make sure it feels as a safe environment: this is a place to experiment and be open minded, we are all in it together, it is not a place to format people’s creativity and be restrictively critical. 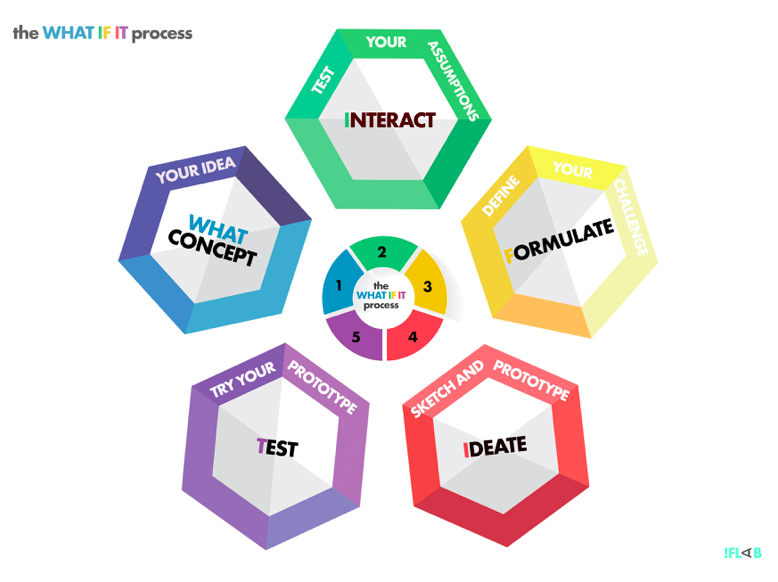 What I have learned as Head of Studies of !F Lab for the past 4 years, is that it is only by constantly iterating our own process that we can stay current, and that creating an interactive methodology is a creative process in its own right. This is not hard science and there are no clear books about it, so we have to try and test it on the go. 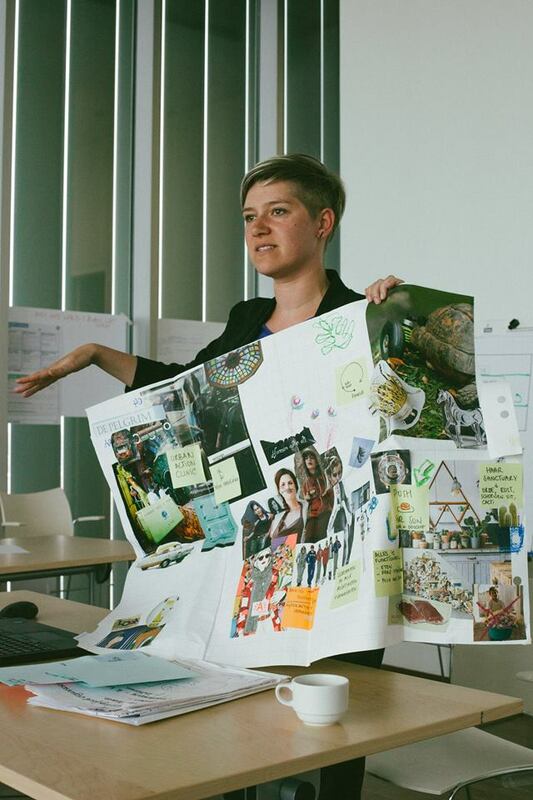 I am blessed by having very talented collaborators as Mike Robbins (Helios Design Labs & High Road Productions), Wim Forceville (VR specialist), Laure Cops and Wouter Vanmol (Nunam Productions), Sandra Coumans (iDrops) and, this year, Jamie Balliu (Interactive UX expert) and it is only together that we can create a coherent all. Interactive creation is a collaborative process, so only a large team can cover all its facets! So there you go… it is work in progress for us as well. 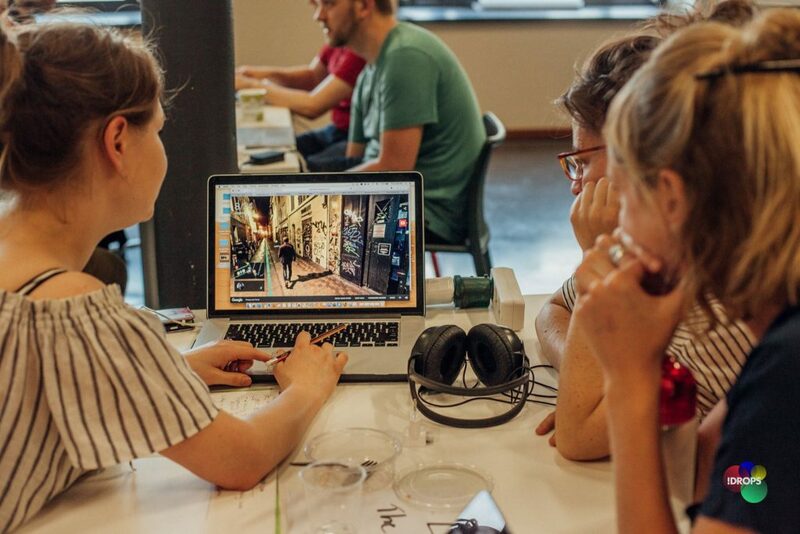 But when we look back, we are proud to know that amazing projects such as Tzina VR by Shirin Anlen (Israel), Ava & Trix, an educational app by Jill Vanpvrys (Belgium) and Aurator, a web platform for public engagement about Synthetic Biology by Britt Wray (USA) also developped via !F Lab, and we salute their success! I also feel blessed that Creative Europe makes labs like ours possible. I am a firm believer that public money is essential in allowing creators to take risks, and that in the long term it is worth the investment because it gives confidence and a direction to emerging industries.